This was my old header. 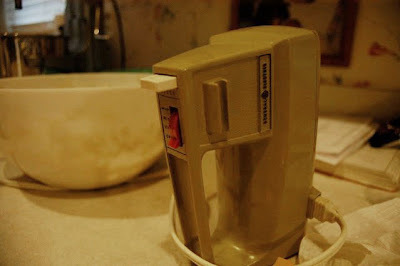 It's a picture of my mom's hand mixer. She and my dad received it as a wedding gift in 1970. Somehow, after 40 years, it still keeps on mixing. It's been used to make birthday cupcakes for me and my sisters to share with our classmates, pineapple upside-down cakes for my dad (his favorite) and my first venture into creative cake decorating: a Merry-Go-Round cake, complete with stand-up animal crackers and a Big Top crafted from a paper plate. Basic, yes, but a sizable challenge for a 7 year-old who can barely reach her chubbed-out arms over the counter. I took this picture last December, a few weeks before I unveiled my first post on this blog and months before I had even begun to grasp the concept of post-processing. You can say it. The composition is busted. Amateur. White balance? What's that? Anyway, while it pains me to part ways with such a sentimental picture, I figured it was time for a change. One of Berry White's best friends, Allen, created the poppin' fresh new header. Not only is he ultra-talented but he also nerds out over beer as much as we do. This is why we're pals. Thanks guy! BTW: my word verification code says "hopyr" -- could anything be more appropriate? Love the new banner. Great work, Allen! The new look is lovely. Don't worry, your mom's mixer knows you still love it. Erin - I keep a picture of it in my wallet. The new one looks really cool! Oh but I liked the old one too.